Christmas: It’s All About Priorities! Hunter Mahan is a professional golfer—and a pretty good one at that. I’m sure most of the golf fans here have heard of him. He’s won several times on the PGA Tour since he joined it back in 2004, when he was in his early twenties. On Saturday, July 27, 2013 he was in great position to win yet another tournament—this one the 2013 Canadian Open in Oakville, Ontario. The prize money he was competing for that weekend was over one million dollars. Not bad for four rounds of golf, eh? And he was ahead by two shots going into Saturday’s third round. Definitely not a bad position to be in. His tee time that day was 2:50—a little later than usual because of a rain delay, so he decided to spend the extra time warming up on the practice range. But his practice session was suddenly interrupted when his agent, Chris Armstrong, ran up to him holding out a cellphone. Hunter took the phone and spoke to the person on the other end for a few moments. Then he handed the phone back to Armstrong, and without any hesitation whatsoever he took his equipment, packed up his belongings, dropped out of the tournament—and headed off in a car for the airport to get on the first available flight to Dallas. Which, of course, leads to the obvious question, Why? Why would a PGA professional who was leading a golf tournament that had a huge cash prize just pack up and leave? Well, it’s because the person calling Hunter Mahan that afternoon was his wife Kandi—his pregnant wife Kandi, who had gone into labor with their first child 3 weeks early! This was July 27; her due date was August 16. She actually called her husband from a car while en route to the hospital. Now I’m happy to say that he made it home in time! 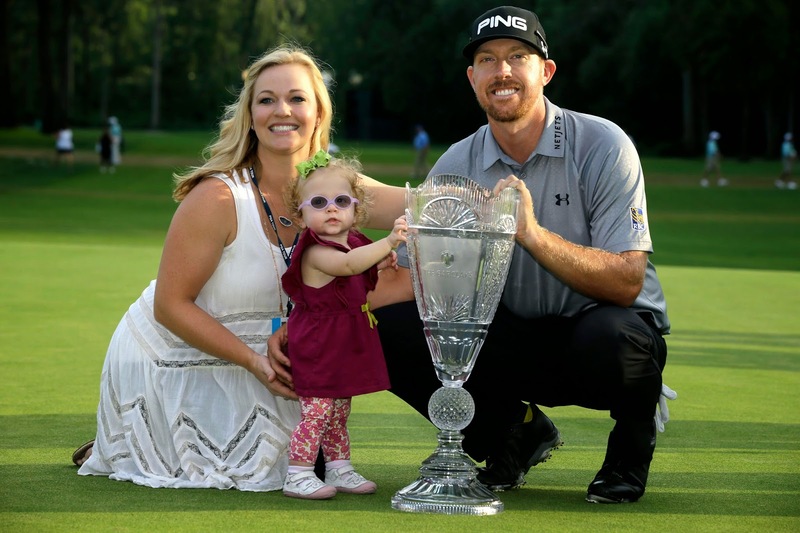 Hunter Mahan made it there in plenty of time to see his daughter, Zoe Olivia, born at 3:26 the following morning. But his decision to leave the Canadian Open when he was in the lead by two shots caused quite a bit of conversation in the sports’ world for a number of weeks afterward. It was hard for some people in our extremely materialistic society to understand why Hunter Mahan made the decision he made. Maybe it’s even hard for some of us to understand. I tell you this story on Christmas Day for a reason—a very important reason. It’s because this beautiful feast of Christmas also happens to be about PRIORITIES! Perhaps we’ve never thought about it that way before, but it’s true nonetheless. And first and foremost, IT’S ABOUT GOD’S PRIORITY OF US! The fact of the matter is, for the Creator of the entire cosmos—for the all-knowing and all-powerful Lord of the universe—WE ARE A PRIORITY! And we’re not just any old priority, we’re A TOP PRIORITY! You could modify that text to say, “For God considered each and every one of us to be such A PRIORITY—such an important and precious priority—that he sent his Son Jesus Christ into this world to die for our sins, so that everyone who believes in him might not perish but might have eternal life,” and it would mean the very same thing. All of us need to hear that—especially those in this church right now who are close to despair. Nothing is more precious to a good father than his child. Just ask any good father you know and he’ll tell you. And yet the best father of all—the heavenly Father—sacrificed his only begotten Son for our eternal salvation. And he would have done that if we were the only person in human history who needed redemption. For him, each of us is—and always will be—a most precious priority. Of course, the real question is: Is HE a priority for us? He should be—he deserves to be—OUR MOST IMPORTANT PRIORITY in this life. Is the Lord enough of a priority for me to make time for him every Sunday and holy day by attending Mass? Or are other things—like sports—more of a priority? Is the Lord enough of a priority for me to make the effort to talk to him (and to listen to him) every day in prayer? Is the Lord enough of a priority for me to examine my life honestly every day in light of the gospel, and to seek his forgiveness regularly in the sacrament of Confession? Is the Lord enough of a priority for me to make the daily effort to help my brothers and sisters in need, as Pope Francis has been telling me I should? Is the Lord enough of a priority for me to change my life where it needs to be changed, so that I can be a more faithful disciple of his divine Son? Those are important questions for us to reflect on today (and I include myself in that group). All of a sudden I realized: It’s there in the name! The thought I should end my homily with this year is there in the name—her name. So the bottom line is this: Hunter Mahan had the right priority when he left that golf tournament last year—and he was rewarded. He was rewarded with a beautiful little girl whose name points us toward the life of heaven. He was rewarded with Zoe! Which is exactly what happens to those who make God and their relationship with God THEIR VERY FIRST PRIORITY on this earth! When all is said and done, and they leave this mortal existence behind, they, too, end up being rewarded with “Zoe”. And that reward—that Zoe—lasts forever! 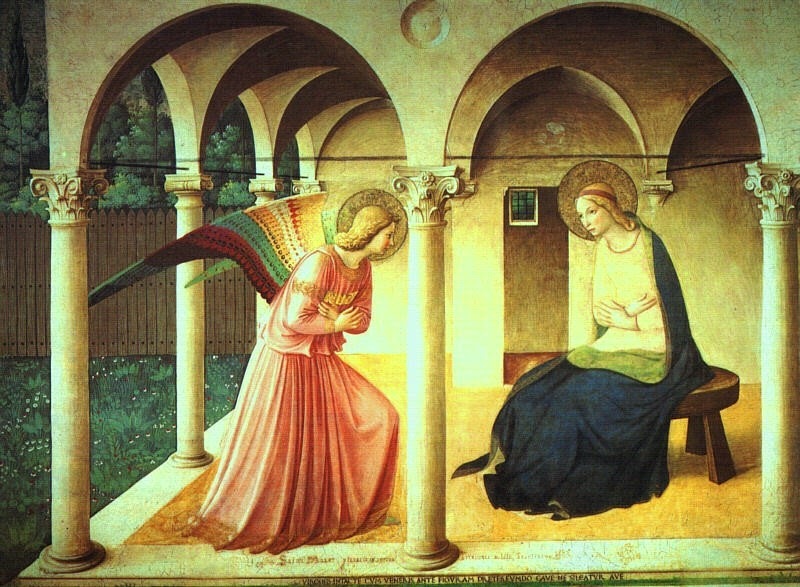 "The Annunciation" by Fra Angelico. I’m sure that many of you have seen the show “House Hunters” on the HGTV Network. I sometimes watch it with my sister and brother-in-law when I’m in Barrington on my night off. As homeowners, they really enjoy it. The format of the program is pretty simple: A couple (hopefully heterosexual AND married!) is shown three houses by a realtor, each of which they have the opportunity to buy. These previously-occupied homes are chosen for them because they have the features that the couple is looking for, and they’re priced within the price range that the couple can afford. The drama of the program (if you can call it that) comes in trying to figure out which of the three homes the couple will finally decide to buy at the end of the show. Now often the decision is very difficult for them, because none of the homes they get to see is perfect in every way. Each falls short of the ideal; each, to some extent, is imperfect. For example, in the first house the kitchen might be too small, in the second all the bathrooms might need remodeling, while in the third some walls might need to be torn down or repaired. So part of the decision-making process involves figuring out how they’re going to deal with—and eventually fix—those imperfections. As Catholic Christians, we know that that promise was fulfilled with today’s gospel story—the Annunciation—and everything that followed afterward in the New Testament. In other words, it was fulfilled with the coming of Jesus Christ, and especially with his resurrection—because in and through his resurrection Jesus reigns as King forever: the King of all creation! Notice how St. Luke mentions the fact that Joseph was “of the house of David”. He was a descendant of David; and, according to some of the early Fathers of the Church, so was Mary. Which brings us to the third “house” that we find in these readings. The first “house” was the temple in Jerusalem; the second “house” was the Davidic dynasty that culminated with the coming of Jesus; and the third “house” is none other than Mary, our Blessed Mother. At the moment she said those well-known words to Gabriel—those words we heard a few moments ago—“Behold, I am the handmaid of the Lord. Be it done unto me according to your word,” Mary became (physically speaking) the dwelling place—the “house,” if you will—that Jesus resided in for the first 9 months of his life on earth. And she was a PERFECT house! Unlike those homes you see on “House Hunters,” Mary’s house (that is to say, her life) was perfect. It was without sin. But, of course, we don’t always obey, do we? Which is why we, unlike Mary, need to get our imperfect “houses” cleaned every once in a while in the confessional! Sometimes only a light cleaning might be needed; at other times a heavy, deep cleaning may be required. Which leads to the obvious question: Did you get your “house” cleaned this Advent? Hopefully you did. If you didn’t, don’t worry—we’ll have confessions again next Saturday, 3:30 to 4:30pm. Comparing our lives to houses (as I’ve done in this homily) can help us to understand many things. It can help us to understand Mary’s holiness, and it can help us to understand our need for forgiveness. It can also help us to understand something else which is very important. It can help us to understand why God allows certain sufferings in our lives. St. Thomas Aquinas would say that God allows evil (he doesn’t cause it, he allows it) for the sake of a greater good. Ultimately that means he allows it so that we will grow in holiness and become more like Mary: a more fitting “house” for Jesus to dwell in here on this earth—and in eternity. C.S. Lewis wrote something along these lines in his famous book, “Mere Christianity.” I’ll leave you today with his words. If you’re dealing with a difficult cross in your life right now, you will hopefully derive some encouragement from this. It’s a command that can be very hard to follow, even if we really want to. 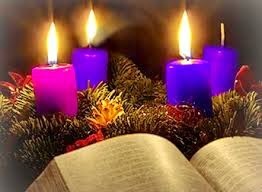 Today is known as “Gaudete Sunday”. It’s the Sunday when we light the third candle—the pink one—on our Advent wreath, signifying that the season is now more than half over and that Christmas is fast approaching. And so the Church tells us to do what St. Paul tells us to do in that text we just heard from 1 Thessalonians 5. The Church tells us to REJOICE! In fact, she not only tells us to do that, she COMMANDS US to do it! “Gaudere” in Latin is the verb that means “to rejoice,” but “gaudete” is the imperative plural form of the verb—which means it’s a command! It’s a command that’s being given to you, to me—to all of us—and to every single human person on planet earth. Which is why I said what I said at the beginning of my homily: It’s a command that can be very hard to follow, even if we really want to. Because we can always find a reason NOT to rejoice! Even if we’re relatively happy and content with the way things are going in our life right now, there will always be some reason for us not to rejoice. It might be something we’re personally experiencing which is pulling us down emotionally; it might be something negative that somebody else is experiencing. Think of the shootings at Sandy Hook Elementary School in Newtown, Connecticut that occurred two years ago this week. Most of us didn’t know any of the victims or their relatives, and yet I dare say that all of us were deeply affected by the tragedy. As I see it, there are two major categories of reasons for us not to rejoice. The first is the general state of the world; the second is the particular state of our world. The general state of the world is determined by the kinds of things we read about in the newspaper every day: the murders of innocent people—like those that took place in Newtown; the rioting; the terrorism; the wars; the greed; the abuse of various kinds. The particular state of our world is determined by what we are experiencing in our life at the present time, or by events in our past that are still troubling us today. For example, some of you have lost loved ones suddenly and tragically—for some of you that’s happened in the recent past. Some of you have lost your jobs recently; some of you have been diagnosed with a serious illness recently; some of you have relatives or friends who are going through difficult times. The possibilities, unfortunately, are almost endless. And this why it can be hard to rejoice—especially around Christmas, when the general perception is that everyone around us IS filled with joy! That, by the way, is a false perception—everyone out there is NOT filled with joy! But, because of all the decorations and music and parties at this time of year, that’s the way it can appear to be. So what’s the answer? Is it possible to fulfill that command to rejoice even when bad things are happening in the world out there and in our own little world in here? The answer, I’m happy to say, is yes! Yes, it’s possible to “gaudete”—to rejoice—in times of suffering. Yes, it’s possible to rejoice in times of trial. Yes, it’s possible to rejoice even in the worst of circumstances! It’s possible because, in the midst of all the reasons—all the many reasons—that each of us has NOT to rejoice, there is always one reason for us TO rejoice. AND THAT REASON IS JESUS CHRIST AND WHAT HE HAS DONE FOR US! First of all, let me make the necessary distinction between “feeling joy” and “rejoicing.” Feeling joy is an emotional response to something that pleases us. Children, for example, will see their presents under the tree on Christmas morning and they will feel joy. That will happen quite naturally. And if they’ve been particularly good during the previous 12 months, they will feel a lot of joy! Rejoicing is different—very different. Biblically speaking, rejoicing is not an emotion or an emotional response to something that we find attractive or pleasing. Rejoicing in the Bible is an act of the will. It’s a conscious and deliberate decision: a conscious and deliberate decision to praise and glorify God regardless of what we happen to be dealing with at the present time. I don’t always “feel joy.” Neither do you, and neither does anybody else. But even when I’m not feeling joy I can still make the conscious and deliberate decision to rejoice, based on what I know, by faith, to be true. And there we have the key to it all. If I want to be able to rejoice on the third Sunday of Advent (and on every other day of the year), I have to make the effort—the conscious and deliberate effort—TO LOOK BEYOND all the reasons that I have not to rejoice, and then focus my attention on those things that my faith tells me are true. I need to focus my attention on the fact that Jesus Christ is Lord. I need to focus my attention on the fact that Jesus loves me with an unconditional love even when I fail him. I need to focus my attention on the fact that Jesus is with me always and that he will never allow me to be tested beyond my strength. I need to focus my attention on the fact that Jesus will always forgive me if I repent—especially in the sacrament of Confession. I need to focus my attention on the fact that everything—including my sufferings—will work for my ultimate good if I love the Lord and stay close to him. If my mind and my heart are focused on truths like those (and not on all the reasons that I have to be sad and depressed), then I can rejoice, and I can rejoice ALWAYS (as St. Paul says I should). Here Mary, our Blessed Mother, is a great example for us. How providential it was that today’s responsorial psalm wasn’t a psalm at all! Did you notice that? In between the first and second readings at Sunday Mass we normally hear one of the 150 Old Testament psalms (or at least part of one of the psalms). But today was different. Today, in place of a psalm, we heard a brief excerpt from our Blessed Mother’s Magnificat. (That was the beautiful prayer she said when she went to visit her cousin Elizabeth. The prayer is found in the gospel of Luke, chapter 1). Mary, like the rest of us, had many reasons not to rejoice: she was poor; she and her people were being oppressed by the pagan Romans; she lived in a violent and dangerous period of human history. Death, literally, was all around her. And yet, as this prayer indicates, SHE WAS ABLE TO LOOK BEYOND ALL THOSE NEGATIVE THINGS AND MAKE THE CONSCIOUS AND DELIBERATE DECISION TO REJOICE! In the midst of all the reasons that she had not to rejoice, Mary found—and Mary consciously and deliberately focused on—the one reason she had to rejoice always: GOD, and all the great things he had done for her and for her people. Holy Mary, Mother of God, pray for us, that we will follow your example, not only during these days before Christmas, but throughout the entire year. Amen. When we were on vacation in Houston a few weeks ago, Fr. Brian Sistare and I did a number of enjoyable things. We went to a Houston Rockets basketball game; we went to a Houston Texans football game; we spent an entire day at the Johnson Space Center; we went to the local zoo (we always go to zoos when we’re on vacation); we even went biking a couple of times. The weather was cool during most of the week (at least it was cool by Houston standards! ), but that didn’t stop us from experiencing a lot of the city. But the most inspiring thing we did (at least from my perspective) occurred on Saturday, when we spent the better part of the afternoon and evening visiting with Heide Zuniga, her husband, Lou—and their 5 children. Heide is originally from Westerly. She’s the daughter of Sharon Feist (who’s the secretary at our school)—and she’s a former member of my youth group. I consider Heide to be one of my many spiritual children, and I’m happy to say she turned out to be a really good one! She and Lou are very serious and committed Catholics, who have been deeply involved in many aspects of parish life and ministry over the years (especially when they lived in Arizona). 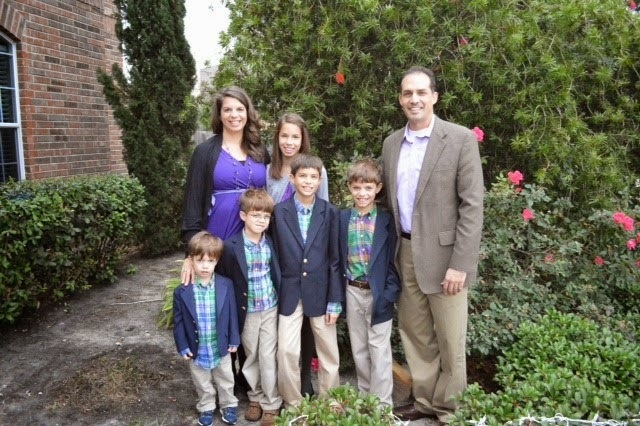 They’ve participated in everything from marriage preparation programs to youth ministry. And she’s a great mother! In fact, that’s what impressed me most about Heide during our visit. Because we were there for several hours, I was able to observe how her children interacted with her, and with Lou—and with one another. Well after a few hours it became very clear to me that these 5 children (although they’re not perfect) are respectful, and courteous—and are being given a solid moral and spiritual foundation to build their lives on. I was even impressed by how Heide exercised discipline. At one point one of her sons misbehaved a bit, and Heide responded by very calmly and very quietly taking him by the hand and leading him off into the next room where the two of them had a little “discussion” (actually it was probably more of a monologue: SHE talked and he listened—whether he wanted to or not!). Then, after a few minutes they came out, and life went on. So what’s the point, Fr. Ray? Why are you talking about this on the feast of our Lady’s Immaculate Conception? Well, very simply, it’s because Heide’s motherhood is a vocation. All motherhood is a vocation; that is to say, it’s a call from Almighty God himself. It’s not a disease—which is what the pro-abortion and pro-contraception and pro-sterilization crowd would have us believe. And I would say that it’s a vocation which has been forever exalted and sanctified by the Immaculate Conception of our Blessed Mother! First of all, we need to remember what the Immaculate Conception refers to and what it does not refer to. All of us are saved by being delivered from sin by Jesus; Mary was saved by being preserved from sin by Jesus. She was saved as we are—but in a different way than we are. And the reason she was preserved from all sin—original sin and actual sin—is because she was called to be the human mother of the divine Son of God. That was her sacred vocation! The reason that the story of the Annunciation is read at Mass today is because the Immaculate Conception prepared Mary for that event—and for everything that followed afterward. Which is precisely my point here! Think about it, my brothers and sisters: God, our heavenly Father, considered the vocation of motherhood to be so important—so influential—so essential—THAT HE ACTUALLY INTERVENED DIRECTLY IN HUMAN HISTORY TO MAKE SURE THAT THE MOTHER OF HIS SON WOULD BE THE PUREST AND HOLIEST PERSON SHE COULD POSSIBLY BE! That’s what Almighty God thinks of motherhood. That’s how much Almighty God thinks of motherhood. If you ask me, it’s about time that more people in our world started to think like God thinks.